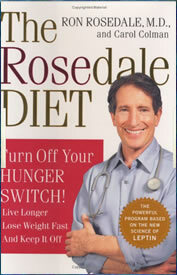 Ron Rosedale, MD, wrote TheRosedale Diet in late 2004. In the book, the author describes his weight loss diet as the one diet that has not been done yet. He is referring to the particular unique nutrient ratios of the diet. The Rosedale diet could be described as a high fat, very low carb, low protein diet. It is similar to the South Beach Diet and The Hampton’s Diet (and even the Atkins diet) – yet places more emphasis on eating a lot more healthy fats. The premise behind the Rosedale Diet is controlling the hormone leptin (see more about leptin diets) . Recent research has shown this hormone to be responsible for control of hunger. Dr. Rosedale argues that by managing this hormone, you will no longer ‘over-eat’ but will be satisfied earlier. Therefore weight loss will occur. Despite containing a lot of science, there is little that is new in The Rosedale diet – except for the leptin research – this is all new research. It has long been known that consumption of fats (particularly unsaturated fats) does help to satiate appetite. The only carbohydrates the author recommends are fibrous carbs (e.g. green vegetables). Starchy carbs and grains are completely out. Rosedale Diet – What do you eat? The protein recommendations are calculated as approximately 1 gram per half your lean body mass. This equates to around 50-75 grams of protein per person per day. There is no calorie counting or carb counting on this diet. The Rosedale diet is all about eating when you are hungry. The diet is restrictive, beginning with a 3 week phase where all starchy carbohydrates are to be avoided. After these first 3 weeks, some other foods are allowed to be eaten – but only in restricted amounts. There are even certain fruits and vegetables that must be avoided altogether! – for example; Banana, Cantaloupe, Dried fruit (all varieties), Grapes, Honeydew, Orange, Pineapple, Watermelon, Yams, Pumpkin, White Potatoes, Corn. There is an extensive section on supplementation (about 25 pages of the book). The recommended supplementation plans would be very expensive to follow, and the fact that the author does have business in the supplement industry always makes this suspect. While there is absolutely no doubt that our food supply is far from nutritionally rich, and we do need to supplement – it should not be necessary to purchase so many supplements for weight loss. “…achieve excellent results even if you never pick up a weight or dust off your treadmill…” – Dr Rosedale. This is something that we all love to hear – lose weight by eating when you want and never exercising. This is just not realistic. The health benefits from exercise are myriad. Ask anyone who has made a physical transformation from obese to muscular – I bet you’ll find that they did pick up a weight, and did plenty of cardio exercise. The Rosedale Diet retails for $14.99. Dieters may also feel the need to buy the supplements recommended in the book, which will greatly increase the diet’s overall cost. The Rosedale Diet is different. Ron Rosedale has been at the forefront of leptin research for sometime. We have also received a number of emails from people who have had success with this diet – not only in weight loss but alleviating other health problems such as diabetes and cholesterol problems. Rosedale, R., & Colman, C. (2004). The Rosedale Diet. HarperResource. NOT an eat all you want eggs and bacon diet. That means very low fat dairy, a bit of egg (whites I think) and tofu are all OK.
You are able to eat a moderate amount of really good EFA rich fats and olive oil which means, nuts avacados and olive oil is OK too. Once you get to part B, a bit of fruit and high fiber crackers. Hey it’s doable, even if you are a vegetarian AND if you have to bend the rules a bit to make it work for you, it seems that it still works, you just might take a little longer to get where you are going. I have had good success recommending this to certain patients who fit the profile IF you can stay on it and it’s the right diet for you, then it WORKS! Easy. Avocado is almost a one food diet. You can eat avocado and nuts and seeds and eat a vegetarian meat substitute or eggs. i just want to tell that this diet has helped me to lose weight more than i expected!!!! How do you do this diet, if you are a vegetarian? Stop wasting your life and eat meat/fish etc! I just wanted to let you know that the Rosedale diet saved my life! My morning bloodsugars were 250, to 350, and I was taking large doses of insulin at meals and bedtime. I started ion august first 2009, and eight months later I have gone from 239 pounds to 182 and still losing! I am taking very little insulin and have as much energy as an active ten year old. I will be 51 years old in september. My doctor is so excited at my success she calls me her posterchild. She has hopes that I may someday soon get off insulin altogether. If I go off your food plan and eat something not good for me, it makes me physically ill. I don’t crave sugar anymore, and my mental state is very much improved. I am so grateful for the friends that cared enough to encourage me to try your food plan and to keep trying! God Bless You!! !I tell everyone I know about your book and they see the success I have had, and some of them are now eating better and getting healthier! How do you do this diet, if you are a vegetarian? I need an answer quick, as my doctor recommended this way of eating. This seems too radical to me, and just a copy of theAtkins way of eating. Please straighten me out on this. How do you do any diet as a vegetarian? Well you substitute meat proteins with plant proteins…beans, lentils, soy, etc. it may take a little creativity but it can be done. Beans are not allowed on the Rosedale Diet. Atkins put no restrictions on protein. Dr Rosedale advocates some restriction of protein as excess protein turns into glucose. I’ve been on Rosedale diet for about 3 years. I have at least 5 close friends on the diet (males ages 40-70). All of us use it to control cholesterol. All of us were taking satins. Currently none of us use satins and all of us have cholesterol under 150. In addition other markers have improved as well, as dramatically. Some exercise and some do not. Further more 2 of the 5 of have had before and after stress tests and in one case blockage went from 98% to completely clear in less than 90 days. Most of us had significant weight loss in the first few months 30-60lbs. Wish we could thank Dr. Rosedale personally. We’re in for life. I have been on this diet for 5 years. I lost 40 pounds the first year and my weight is stable. I stay on the diet for health reasons. I was found to be pre-diabetic and this condition reversed with this diet. It also lowered my blood pressure and it has been good for many other minor conditions. I plan to stick with it. Oh, Rosedale also discusses eating fish, which I love and would eat a ton of were it not for mercury contamination. He also presents canola oil as a healthy food and more and more info is coming out on why it isn’t. My family has been on a health quest for a while that started when we found several of us are gluten sensitive. (We also have allergies to certain nuts, and dairy doesn’t agree with us either!) Given that we’ve already made the jump away from wheat, oats, rye, barley and the mainstream grains, and dairy too, we are already so far from the American diet that giving up grains isn’t as hard for us as it might be for some. None of this is “a diet” per se, just refinements on how to eat correctly. We also wonder how much Rosedale is targeting people with diabetes and other disorders or who are eating unhealthily (e.g., white flours). How would his book differ if it spoke to people who already eat very healthily? I’m now 48 (male) and had already begun to figure out that grains make me fat, so does alcohol and especially beer (so sad). Grains are a relatively recent addition to the human diet and there’s a good argument that they are not a good one. Aren’t they a grass, after all? And unlike a cow which has 3 stomachs to digest grasses, don’t we have only one which might be a clue that we shouldn’t eat grasses or else they’ll mess with our blood chemistry? So when we read Rosedale Diet we knew we were on to something by becoming aware of the importance of leptin. The book is very useful in that regard. The book doesn’t have enough to say about what foods can be eaten, when, and how they should be prepared, in our opinion. We also think that while the good doctor knows a lot about blood chemistry, he doesn’t know enough about eating healthy. For instance, he presents soy as a healthy food, which it is not. (Soy contains hard to digest phytates, way way too much estrogen compounds, and is almost always GMO, and it’s even harder for the GI tract to break down than grasses). I was already a flat-belly, but since giving up grains I’ve gotten down to a natural weight for me. (6ft, 170lb) I have no “handles” and I can see a vein on my bicep most all the time. We are having trouble with how much grains to feed our children though. The book DOES say that children are able to switch from energy sources better than adults, but we’ll continue to research this. Also, we’ll read everything we can find on no-grain diets and hopefully we’ll get a more rounded knowledge on this topic. The book may have its flaws, but its description of the importance of leptin make it a must-read for anyone on a health quest. I’ve been using the Rosedale diet for 3 months. I’m at 212# and only 5’3″ and have arthritis so I’m pretty sedentary. I have hypoglycemia, so i have problems staying alert all day. I initially lost 7# on this diet, then nothing more. My health is much much better however, and going off of it just brings symptoms back, so am adopting this as just a good way to eat. I am 48 yrs old & suffer w/ a candida imbalance & osteoarthritis. I have been searching for the right balance to maintain a healthier weight that would also alleviate the cycles of candida & arthritis. After reading Dr Rosedale’s book & applying the basic principles, I have lost 7 lbs after 2 wks w/ another 8 lbs to go. I’ve seen a reduction in my arthritis symptoms & my constant hunger. In the first week I wasn’t willing to give up tomatoes & was eating them 2-3 times a day. The 2nd week, I eliminated them & have seen a quick weight drop & less of a sweet tooth. My goal is HEALTH through good nutrition. It’s good to have a guide for your body to heal itself w/o pharmecuticals & all their side effects. As far as diet science is concerned (I am a microbioligist), this diet makes much more sense to me than other diets I have looked into. That being said, I know we still know much less than we want to about a “perfect diet” and given what we do know, there probably won’t be a magic bullet. As far as determining how many calories to eat overall (as questioned in earlier posts) in fat,protein, and carbs and in what ratios, I would extrapolate that information from this article: (http://articles.mercola.com/sites/articles/archive/2009/05/30/Is-Insulin-Condemning-You-to-a-Premature-Death.aspx) where Dr. Rosedale advises the use of 1 to 2 grams of protein per pound of lean body mass based on activity level (i.e., zone, protein power?) For example, 150lbs person with low activity level (20% body fat; 115lbs lean body mass) eats 115 grams of protein per day (460 cals from pro.) As he says this should comprise 30% of cals. ; then 20% from carbs is (little algebra… 30%/115g = 20%/x(g); x=77g of carbs per day). So 77grams of carbs per day at 308 cals and 50% from good fats is 85g – 768 cals. Total calorie intake is 1536, which is a low calorie diet and whether the hormone claims are true or not, with exercize, even the insulin resistant should lose weight quickly, if not over time if they follow the low gi carb, as well as fat and protein composition components of the diet instructions. Though this diet may be difficult to maintain in our culture, there is no doubt that the science behind it is valid and much more healthy than the food pyramid (I was taught in school) for the purpose of general health, weight loss and longevity. The strictness of the food restrictions could be adjusted to healthy alternatives (not fast food or what most people enjoy eating in America) I imagine for those without specific health concerns to little effect. For the purpose of weight loss, health maintenance and longevity I think this diet proposes a very healthy way of eating that is safe under the supervision of a doctor. Supplementation is another subject, but the bare consumption of the food as prescribed will be as healthy or moreso than most American diets and diets specifically for weight loss. Also, in response to an earlier post regarding how individual difference is a factor in whether a diet works or not, I agree with a few caveats. We all metabolize calories in amounts relatively close to predicted rates and the science related to dieting in both disease populations (e.g., type 2 diabetics) and non-disease populations can be generalized into many healthful recommendations from doctors that subsequently cause predictive healthful results among patients. That being said, our primary problem in America with regard to diet is doctors like Rosedale aren’t funded to do large population studies with healthful diets that could in turn reduce taxpayers contribution to the medical industries, American’s are bombarded with unhealthy propagandistic marketing from food corporations, Americans have been taught that it’s not our fault that we eat bad food because “were hungry” (with pouty lips) and a healthy diet is aberrant and only for people who are overweight. I like this diet so far, but in five years we may have more or better information… I already eat like this… basically, except I include some of those high fructose fruits that I wouldn’t advise for weight loss. Hello I’m a Mexican MD and Homeopath. I’d like to know if the book has been translated into Spanish annd someone has already done the math to convert the ciphers he mentions- Farenheit to Centigrades, pounds to kilos, inches to cms. Of course I could do that too if I have to, but if its been done already, all the better. Thank you. I was attending 7 days course on rose dale diet in india.. From the first day..I was able to see my energy level increasing and hunger reducing..It is excellent diet to follow..if you need energy..
Back in August Karen mentioned that she didn’t like Rosedale’s homemade mayonnaise, but I have to say that I really like it. It is by far my favorite homemade recipe, and I have tried a lot of them because commercial mayo makes me very ill due to a cooked egg white allergy. Rosedale’s recipe is so mild and smooth, gives a light creamy texture to whatever it’s added to. Laura, I mean no harm, but the “diet” didn’t fail you, you failed the “diet.” You gained the weight because you went off the plan. This is not about weight control, it’s about health. If you get to a so called stall, then so be it. Your body is trying to heal. Make this a way of eating for your health for the rest of your life, not another “diet” to lose weight. People think that they can lose weight and, miracously, are healthy. They go back to eating as before with the mentality that “I lost weight before on this ‘diet’ and I can do it again.” What you haven’t learned is what’s really happening to your body. Read this article, if you haven’t already. .
Best of luck in ending the torture you place on your body. I hope you manage to stay free from heart disease, diabetes, obesity, arthritis, osteoporosis, autoimmune diseases, arthritis and cancer. Like I said I mean you no harm. I wish only to open your eyes and say something that will help you succeed in life. I am 32 years old and have never been heavy but very athletic and I had to stop being so athletic when I decided to go back to school and do my MBA a year ago and put on 40 pounds in a year due to eating fast food and eating late at night while studying. I have been on the Rosedale Diet since last June and have lost my 40 and another 20 and I am down to my high school weight. I look great in my bikini and I love the diet because I love fish and green vegetables and no longer crave the salty foods and chocolate that I once lived on. My mother-in-law is a nurse and has been on this diet since she was doing her RN 30 years ago (when nobody knew about it) and she is 55 years old and has the body of a 21 year old. If you don’t believe in it I say try the first 3 weeks, they are hard but you will be sold at the end of those 3 weeks! This diet is soooooo easy! As of today, I (mal, 43 y/o) have been on this diet for 10 days and lost 16 pounds with no exercise whatsoever. None. I don’t take any of the recommended supplement and I don’t even follow all of the diet’s precepts. Morning: Pecan shake with blueberries and whey protein. Dinner: 2/3 of oven baked chicken breast with 1 slice of whole wheat bread (no butter), broccoli. Some avocado oil dripped on chicken and broccoli. For dessert ( I still have a sweet tooth! ): 10 red grapes. I can’t say enough good thing about this diet. Get the Rosdeale book and educate yourself with other books on leptin. I’ve been on this diet a little over a week and am not seeing great results and I feel ilke everyone else is. I do enjoy eating this way, but maybe I’m not doing it properly. How do I know if I’m eating too many nuts, or cheeses? I’m confused. Of those who are successful on this diet, can anyone give me an example of what you eat on a daily basis? Do I really have to do the calcualtions and mke sure I’m over consuming protein and only eating up to 50% fat? Is 50% fat even correct? Does anyone use ketone strips to test to see if they are in ketosis and if so, if you are in ketosis does that mean I am following the diet correctly. I don’t know why I’m having a hard time with this one but I feel like maybe the book is vague and the recipes include foods on the B list when you’re supposed to start with only foods on the A list.. I have been on the Rosedale Diet for the past 16 weeks and I have lost 13 pounds. The best thing for me was that I have renewed energy. I was tired all the time and thought I had sleep apnea. Doctors could not tell my why I had no energy. Now that I take the supplements I feel great and for the first time in a long while I am less than 200 pounds. I recommend this diet to anyone who is struggling with weight and felling like you want to sleep your life away. The diet really works and you really do have to avoid potatoes. I take coumadin and have tried to lose weight but can’t. I exercise about 45 min per day and really work out good, but can’t shake the weight. I gained “40 lbs on the coumadin in about 4-6 months. I also have factor V blood. Has this diet worked for anybody in my situation? I have now been on the coumadin just starting my 3rd year. Help!!!! Age 66. Lost 13 pounds in 24 days, plenty of energy, I feel good. Find this is very simple, easy way to eat. Hope to eat this way from now on! If you are like me, and plans like Weight Watchers and Pritikin absolutely do not work for you, even with intense exercise levels, then try this plan. WW & Pritikin failed me. I didn’t fail at them. I stuck with them. But they didn’t work. I didn’t lose weight and my triglycerides stayed high on them. But this one works and works well for me. My blood lipid profile has improved dratically and my huge appetite, which I was constantly fighting, is a thing of the past now. While my cholesteral wasn’t considered high before, it is now, on Rosedale, in the “very good” range. I didn’t have clinical indications of blood sugar problems, but in my mind, I certainly had the symptoms. Those too have gone away on this plan. I’d recommend it to anyone else for whom weight loss has seemed impossible. Maybe those plans are failing you too. Ron Rosedale obviously never made his homemade mayonnaise. Don’t try it. You can find the proper way to make it on the internet, before you waste that precious advocado oil. My husband and myself have been on the Rosedale Diet for 6 weeks and it is the first diet that my husband has ever embraced. He was 205lbs and at 5’8″ was quite overweight. After his last visit for his annual check up and blood test the doctor cautioned him against high cholesteral levels and suggested he lose weight. He is a regular reader of Dr Mercola and that is where he read about your diet. He bought your book and has lost 20lbs. He is so pleased. He is a big potato man in fact he grows potatoes to sell to the local high end restaurants. So you can imagine how he felt about NO potatoes. As for myself I have gone from 135lbs to 125lbs and the best thing about it is that my blood pressure has come down significantly. I am taking a diuretic and a beta blocker and if my blood pressure readings stay low I am considering asking mt doctor if I can be weaned off the meds. Thank you. Moira and Doug Minke. Guelph, Ontario, Canada. P.S. When you say that Keto spaghetti is low carb high protein, exactly what are the numbers? I have been dieting for many years – honestly, probably 20 some years in all. I’ve always tried to find the right diet – and I’ve tried everything from Weight Watchers, to high protein, high carbs, more fruit, less fruit, more raw, less raw, macro (which I actually still do believe in, minus the rice), and so many others. What I’ve found is that it’s not the diet that works. It’s how your body reacts to the diet. Tons of people lose on WW, since it’s right for their body types. Tons of people lose weight on all the others, as well, since it fits their body type. But you have to keep trying until a certain diet links in with your genetic makeup and pre-dispositions, and it’s highly personal. It’s highly personal, yet you can’t change it. I for one am seriously addicted to carbs. A lot of diets do address this problem, but not as effectively as The Rosedale. It’s worth a try, after all. It’s like a key in a lock, and instead of looking for “a key” or “a diet”, I think we should try looking for the key which works with our “locks”, or a diet which meets us where we are. If your problem is high Leptin, or Leptin resistance, and High Insulin (not necessarily the same as insulin resistance) Then this diet will reverse the phisiology that has made you obese and let you loose weight. It’s the only diet that addresses these issues! If you are overweight because you are an inactive overeater, it will not help you as much. I’ve been on this diet for about a week and I’ve dropped 5 lbs. My brother who got me on this diet lost 35 lbs. and my sister lost 10 lbs in 3 weeks. None of us really work out, so I’m amazed at how well this diet has been working for us. This diet is the only diet I have ever been successful with. I lost 45 lbs. in 6 mos. and have kept it off and lost 30 more because of the life style changes now 4 years later! i found that I was still hungry and I was tired following this diet. never new the amout of nuts I was allowed to eat andfound myself over eating them. Absoultely without a doubt, The Rosedale Diet is an answer to the question of ‘how do you become fit AND stay healthy?’ This is an absolute must look at. It is the best of the best. Hope this helps!! !